This feature can be accessed from the Discovery>Review Batch page. It provides the ability to retrieve a Review Batch, access the documents in the Review Batch, and check the Review Batch in or cancel the Review Batch. This feature will walk a reviewer through the process of getting a Review Batch, accessing the documents in the Review Batch, and checking in a Review Batch. Navigate to the Discovery tab. From there, click on "Review Batch". On the left side of the screen under "Review Sets", choose the appropriate Review Set. If there is only one Review Set, it is automatically selected. In the example below, Review Set "Example 1" is selected. Click on the "Get Batch" button. Your Browser window will now be populated with the documents contained in the first batch of review set "Example 1". At the top of the main table you will see the number of total documents in the batch, broken down further by the number of parents and the number of attachments. 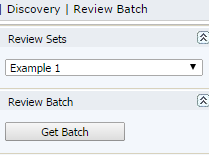 Under the section titled "Review Batch", there is a hyperlink reading "Review Docs in Batch". 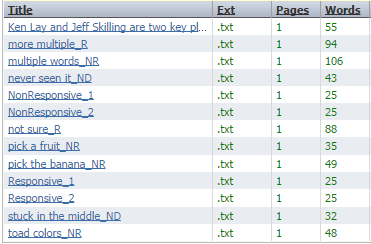 When you click on that link, your Document Viewer will open with the first document in your Review Batch. When all documents have been coded in the Document Viewer and you are ready to check the Review Batch in, you will navigate to the left side of the screen under the "Review Batch" section and click on the "Batch Done" button. You will be asked to confirm your check in of the Review Batch. Click "OK" to confirm check in or "Cancel" to return to the Review Batch. Following checking in the Batch, your Browser window will show 0 checked out documents and the "Get Batch" button will be activate allowing you to check out a new Review Batch. If there are no more Review Batches to check out, the button will be grayed out and a message will indicate that there are no more documents in the Review Set. If you need to cancel the Review Batch you currently have checked out, navigate to the left side of the screen. Expand the section titled "Advanced Options" and click on the "Cancel Batch" button. We also offer Consulting and Technical Services (billable hourly) to help you create a review set, identify documents to add to the review set, create review batches, release the review batches to the reviewers, check a batch out, and check a batch in. Please contact your sales rep or our Support Center if needed.